Groupon has identified three international daily deal sites to acquire that will help Groupon grow in India, Isreal, and South Africa. 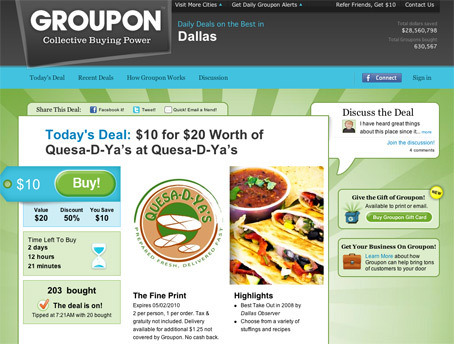 Groupon has just received a $950 million round of funding that will help it move deeper into the International market space. Based on information from Rob Solomon, Groupon president and COO, Groupon is specifically acquiring three daily sites to expand in India, Isreal, and South Africa. The first of the three companies is SoSasta, which has only been around for 3 months has deals in 11 Indian cities. The next acquisition is Grouper, which launched in March, is the largest deals site in Israel. And finally there’s Twangoo, which serves more South African cities than any of its competitors. Each of these sites will become Groupon in brand and site design over the coming months. They will serve deals in English in India and South Africa and in Hebrew in Israel. Groupon is currently available in 40 countries and has over 4,000 employees world-wide.